At a workshop held on 14 April in Brussels the EPDA presented the findings of the European inventory project to an audience of MEPs and other influential individuals. The inventory – My PD Journey’s first major initiative, developed in partnership with the European Section of the International Parkinson and Movement and Disorder Society (MDS-ES) – aims to identify where gaps in the current Parkinson’s care pathways exist and seek out national examples of good practice that could be replicated in other regions. My PD Journey is a multi-stakeholder initiative for people with Parkinson’s in Europe, led by the EPDA. 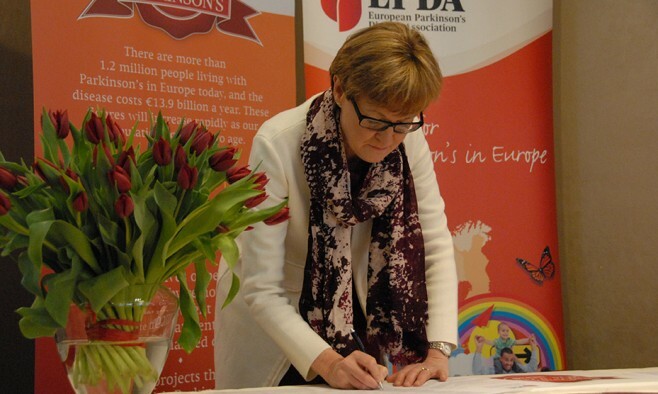 MEPs were also encouraged to sign the EPDA’s Pledge for Parkinson’s and commit to the organisation’s MEP Support Network – an informal interest group, led by the EPDA, whose members are devoted to raising awareness at national and European level.